On 30 May 2017, health leaders from across the world reaffirmed cancer control as a critical health and development priority as they adopted the 2017 cancer resolution, entitled “Cancer prevention and control in the context of an integrated approach” at the 70th World Health Assembly (WHA) in Geneva. The resolution draws on targets set out in the Global Action Plan on NCDs and Sustainable Development Goals to help make the case for increasing national action on cancer. Drawing on best practices from across the globe, it identifies 22 priority actions grouped into four key areas, for countries to systematically strengthen cancer services over time. These should be embedded in national cancer control plans that can drive the introduction or scale-up of services, in line with national priorities and also serve as an important platform to coordinate national stakeholders around common goals. 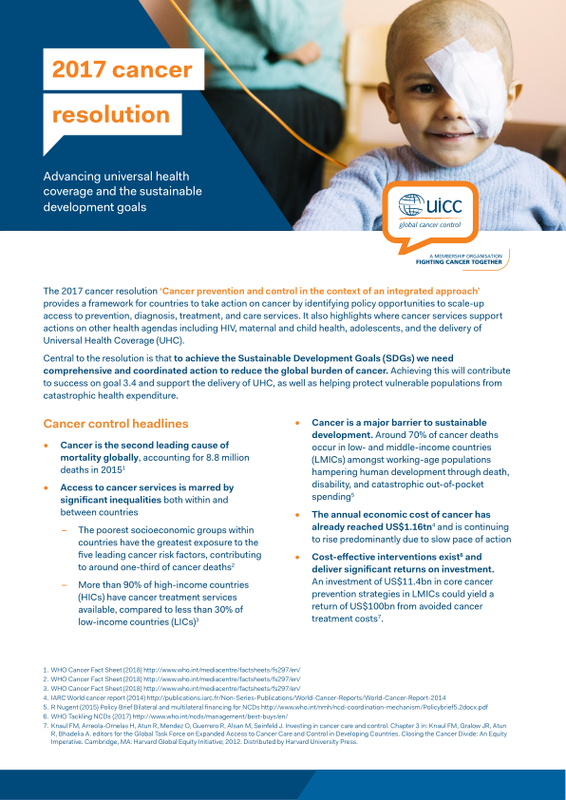 Read UICC’s high-level summary of the 2017 cancer resolution. Critically, the 2017 cancer resolution aligns national cancer control with the growing dialogue on universal health coverage, emphasising the links and opportunities for integration to deliver sustainable cancer care and stronger health systems. Now, the global cancer community is calling for action on the health systems response, specifically, population-based, holistic approaches to programmes and the expansion and scale up of diagnosis, treatment and care services so that no one is left behind. For more information on the cancer resolution check out the webinar recording with Dr Julie Torode, Director of Special Projects. We will soon be sharing further next steps for action following the cancer resolution. In the meantime, please contact UICC's advocacy team via advocacy@uicc.org to find out more about the resolution and how you can support it.